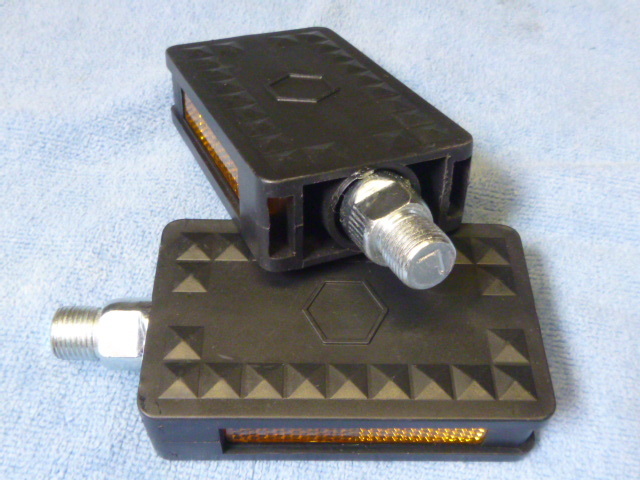 These are new pedal sets, right and left, size 9/16″. The thread is 9/16 – 20. They fit all mopeds except Motobecane, Peugeot, and Derbi, and other French or Spanish-made mopeds, such as the Spanish-made Puch Magnum. 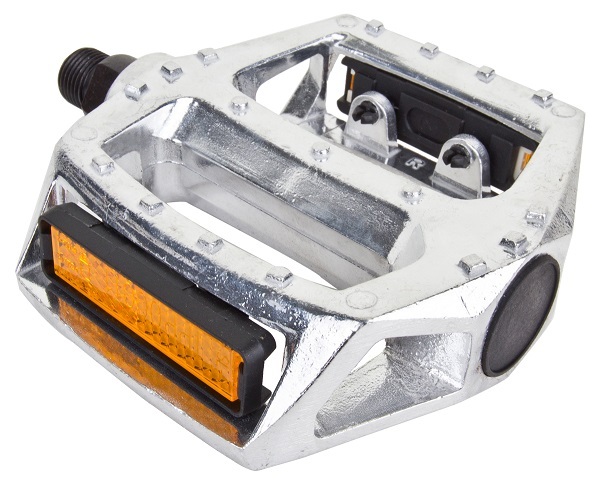 Pedal threads: Most bicycle pedals have either 1/2-20 or 9/16-20 threads. 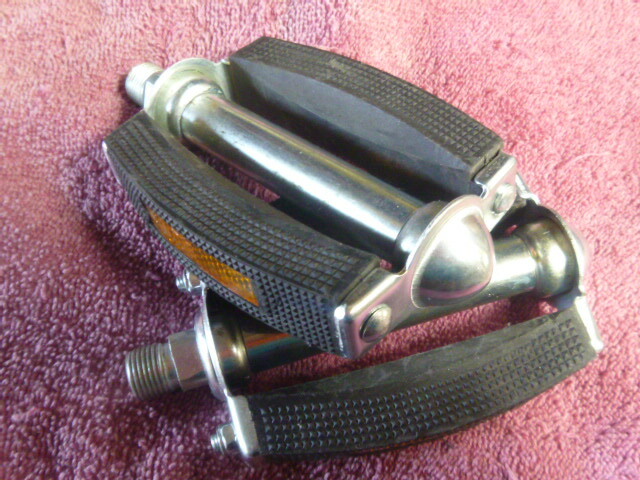 But some vintage bicycles use “French thread” pedals, which is metric 14 – 1.25. The 14.0 mm thread is slightly smaller than 9/16″ (14.3 mm), but bigger than 1/2″ (12.7mm). 14mm pedals screw into 9/16 cranks all the way but fit loosely. Then later they break off or strip out easier. 9/16 pedals screw into 14mm cranks so tight they stop half way. Then later they break off or strip out easier. Left and Right: With shoes it’s easy to tell if they’re on the wrong feet. But with moped cranks it is not. 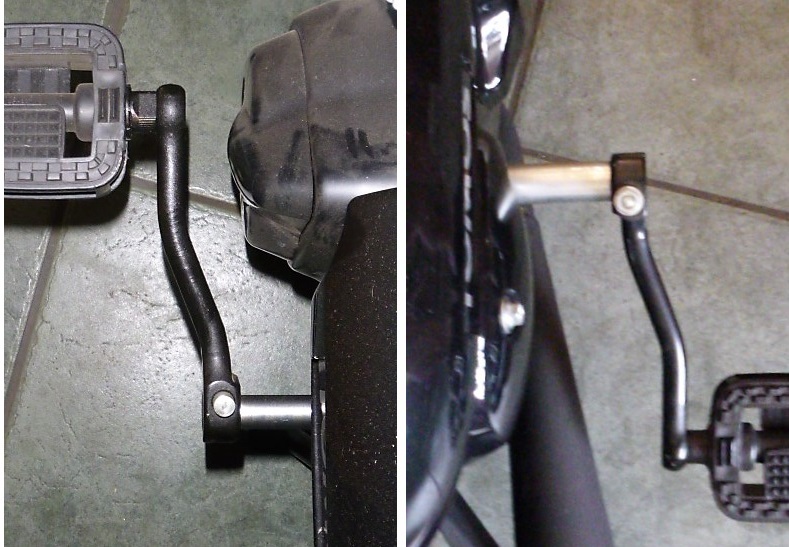 A left crank and pedal looks and functions the same as a right. 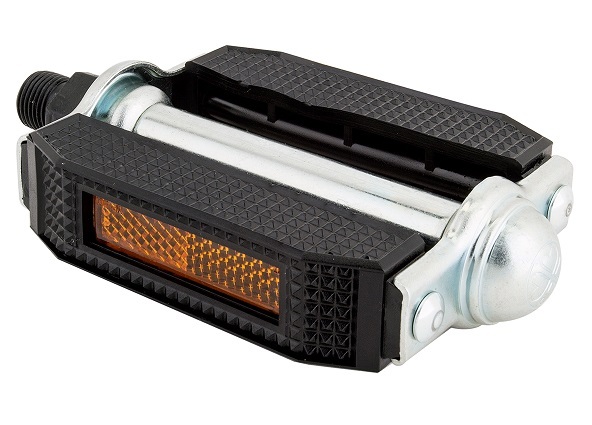 So it is possible for a moped to have both left pedals and cranks, or both right, or the right on the left side and the left on the right side. Then when, say the left side pedal is missing, it might actually need a right, or visa versa. Righty Tighty: This rule says “Viewed from above the bolt head, turning to the right, clockwise, is tightening”. Almost all bolts and nuts obey this rule because they are right hand thread. But left hand threads are opposite. They obey the opposite rule, “Lefty Tighty”. 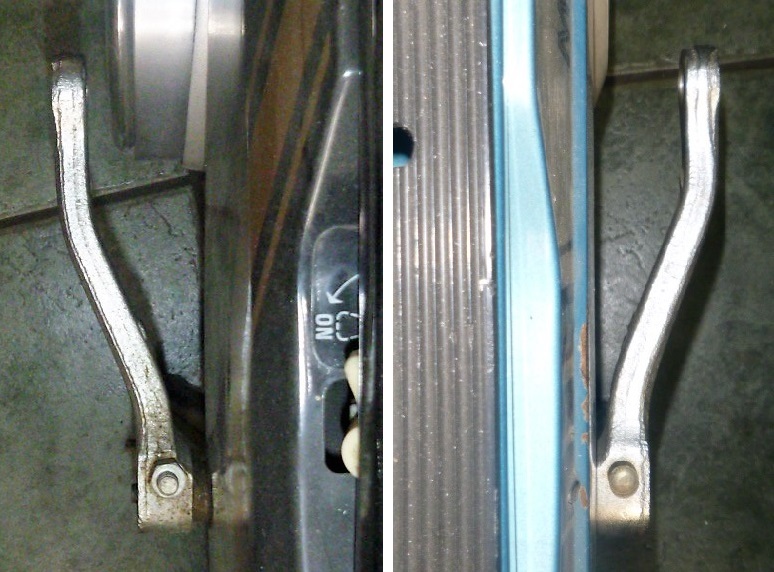 How to tell: It is sometimes not easy to tell if a pedal or a crank is left or right. 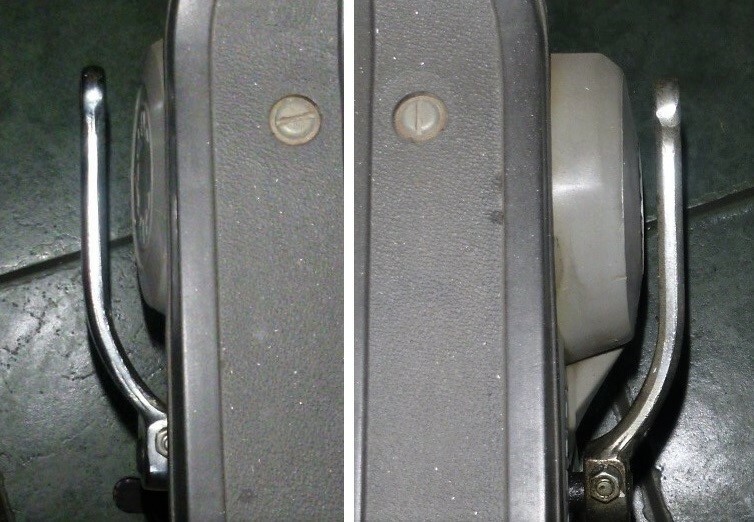 Most modern bicycle pedals are stamped L or R. Most modern reproduction cranks are also stamped L or R. Most vintage European right cranks are stamped D (droit, destra, desno, derecho) or R (recht, right). 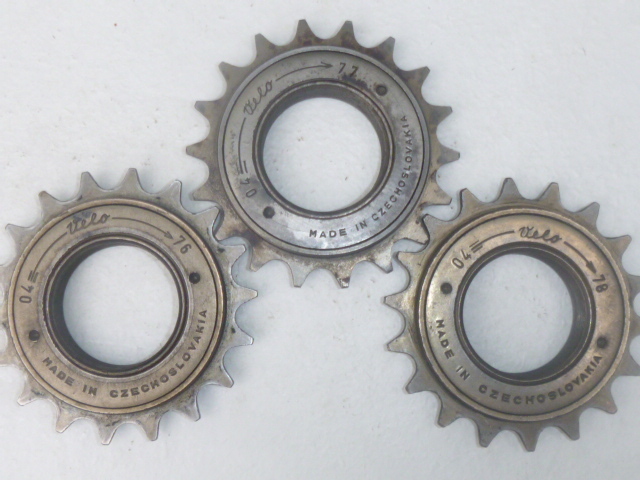 Some vintage European left cranks are not marked, and some are stamped S (sinestra) or G (gauche) or L (levo, left). Another way to tell is by viewing the threads directly. 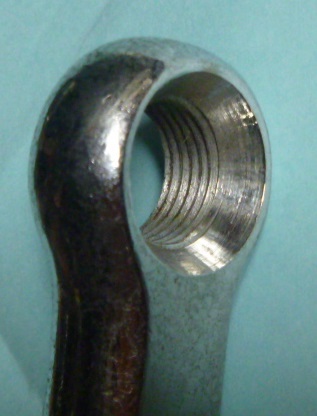 When a right thread bolt is held with the tail facing up, each thread slopes upward going from left to right. 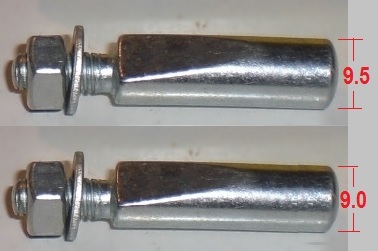 When a left thread bolt is viewed the same way, the threads slope in the opposite direction. 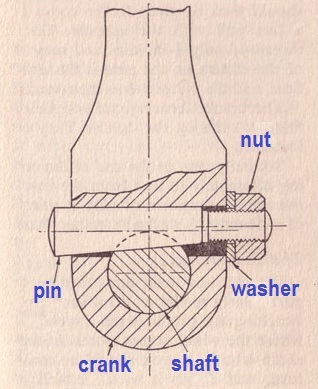 With crank threads, right thread goes inward clockwise, left thread goes outward clockwise. You have to follow the first thread around in a circle with your eyes. How not to strip threads: Knowing which way to turn, using lubricant, knowing how it should feel, knowing how tight it should be, and knowing how to use taps or dies or thread files to “clean up” damaged threads, before they fail completely. Shown here are the S3-style vintage Italian original pedal cranks on Italian (mostly) mopeds with Morini MO1, MO2, M1 engines. These cranks need to be the S3 or M3 style, that “goes outward right away”, because the engine sticks out close to the pedal shaft. 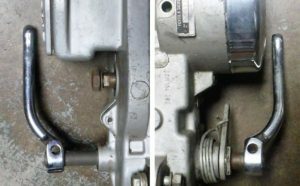 Besides clearing the engine when the crank is horizontal, sometimes this style crank is needed to clear the covers above the engine, when the crank is vertical. Shown here are the M3-style vintage German original pedal cranks on Hercules mopeds with Sachs 505 engine, such as the US-model “Sachs Balboa”. 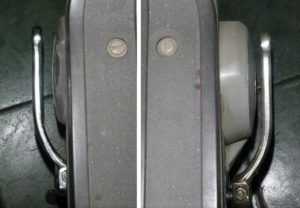 On a Taiwan moped with a Sachs 505 engine, such as “General 5-Star ST”, the pedal cranks are Taiwan made compatibles, that look different but have about the same dimensions and same style. These “go outward right away”, not to clear the engine, but to clear the covers above the engine, when the crank is vertical. 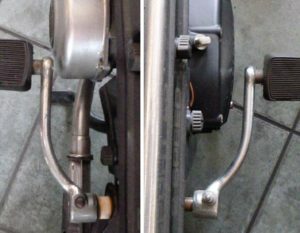 Shown here are the M4-style modern Slovenian original pedal cranks on 1986 and later Tomos mopeds, from late A3 to A35 and A55 engine models. Here the 2009 Tomos A55 engine pedal shaft is much longer than it needs to be, by 3/4″ on the left, and 1 3/4″ on the right, as you can see. 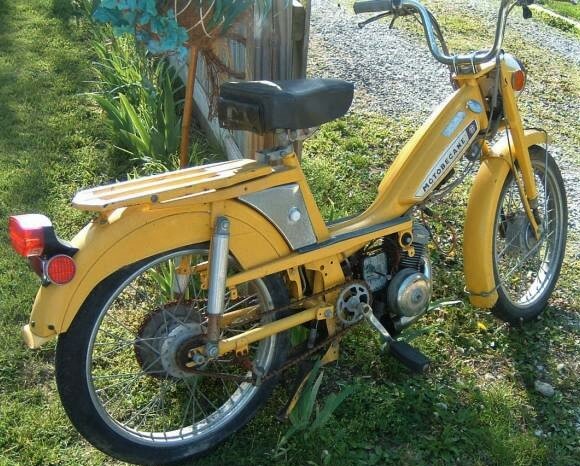 Back in the day, moped engines (and people) were thinner. 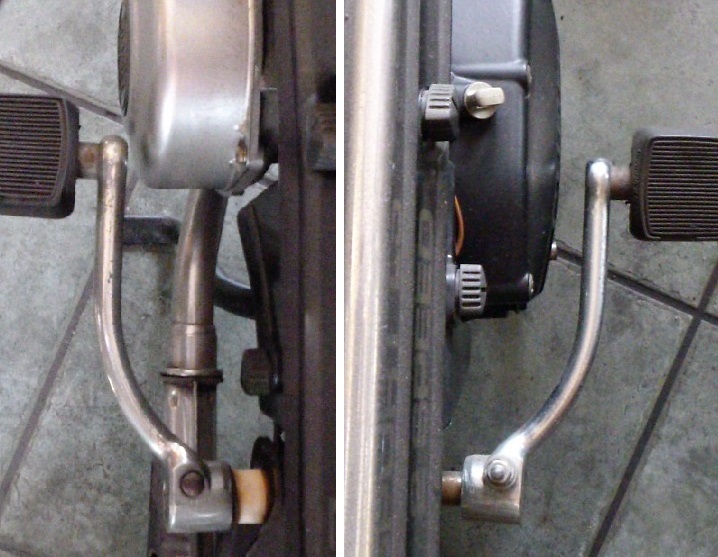 The early 1974-79 early A3 pedal cranks did not have or need much offset, as shown at right. Shown here are the M4-style vintage French original pedal cranks on Motobecane Mobylette mopeds 1972-1980+. On variator models, like 50V, the engine swings back as the bike speeds up. 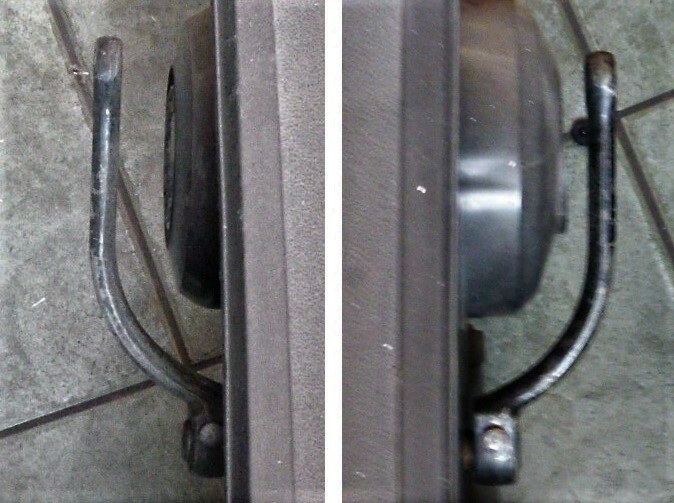 The clutch wheel often scrapes against the left pedal crank. On non-variator (Dimoby) models, like 50 or 40, the engine does not swing back as the bike speeds up (but it does swing to keep the belt tight). On those models there is also 3/8 inch more space between the clutch wheel and the pedal crank. So they “never” scrape. 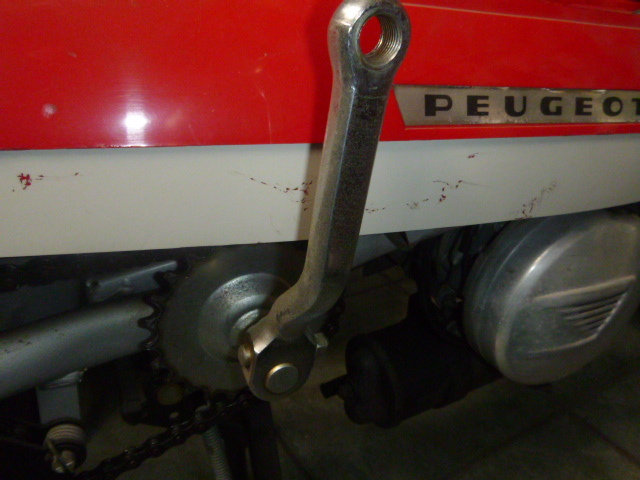 Here is a M2-style vintage French right crank, on 1975-83 Peugeot 103 mopeds. 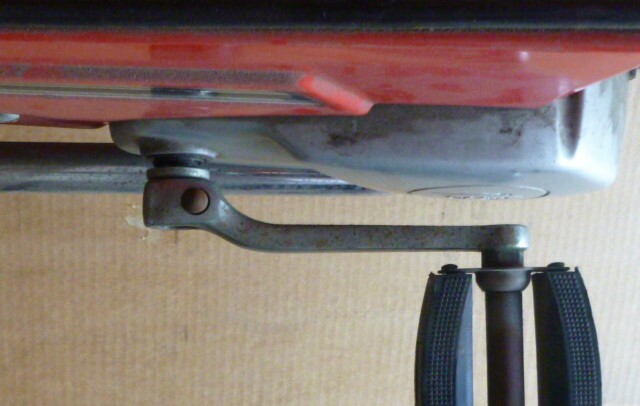 The right arm has sharper bends than left, because the right cover is closer to the pedal arm. The left is a M5-style, with a more gentle bend. 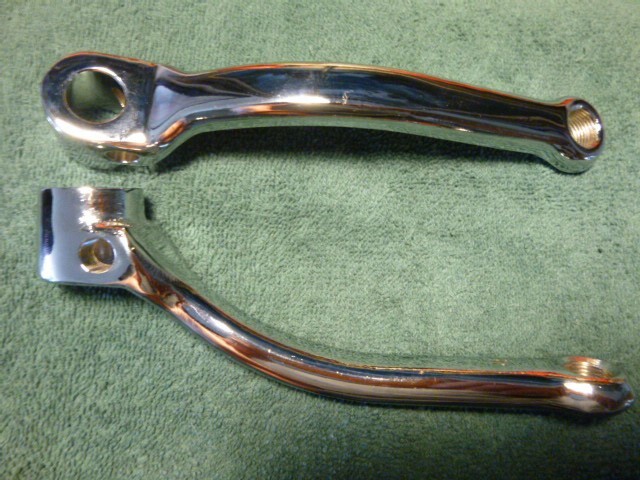 Here are vintage Italian L6-style right and L3-style left crank arms for 1977-83 Garelli Gulp, VIP, and maybe Monza. The left has more offset than the right. It needs the L3 style that “goes outward right away” because the left side of the engine sticks out near the pedal shaft. 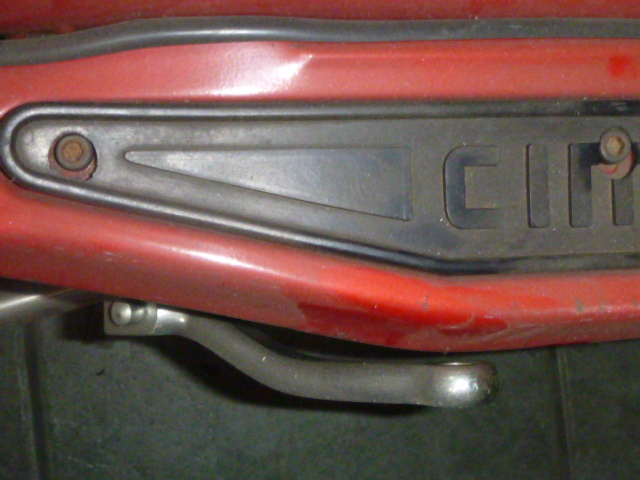 Shown at left are L3-style vintage Spanish crank arms for 1975-1986 Derbi Variant. Shown at right are higher offset L3-style Spanish arms for 1986-89 Derbi Variant Sport. Like Tomos and Garelli the later engines were wider. 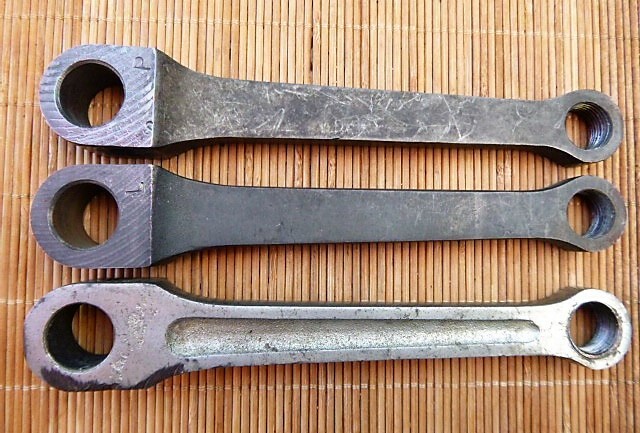 Shown here are the L0-style vintage Austrian cranks on 1978-86 Puch Maxi and Magnum models. There are also L1-style Puch cranks, on 1968-78 Puch Maxi. Those are the same dimensions except the bend is more sharp. What were they thinking? Pedal cranks for Puch mopeds have about 1/3 of the threads removed by machining. This makes them get stripped easier. The only plausible explanation is Puch was thinking about safety. When a rider forgets where the pedals are, and leans over in a turn, one pedal can hit the ground. If it hits hard enough it can cause a crash. 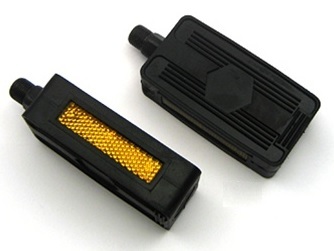 Puch pedals are designed to break away, rather than causing a crash. Offset: Ideally the pedal arms should have enough offset to not hit anything, even after being bent inward a little, yet not have too much offset. 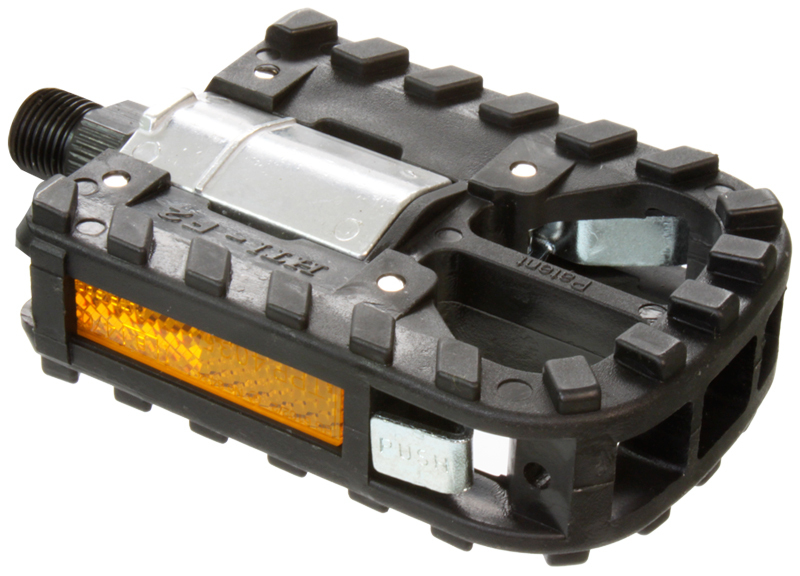 Too much offset causes the pedals to hit the ground sooner when leaned over, and to stick out more when parking or storing, and to hit the riders feet more when backing up. Length: Longer pedal arms provide more leverage. For mopeds the pedals are mainly used for starting the engine, rather than pedaling. So if the engine turns over easily then long pedal arms are not needed. Longer arms hit the ground sooner when leaned over. And when not pedaling, one foot is more forward and the other is more back. So shorter arms are better, in many ways. But for pedaling, longer arms are better, especially for riders with long legs. Style: Some engines or bikes need cranks that “go outward right away” because something is sticking out near the pedal shaft. This is the style S3, M3, and L3 above. 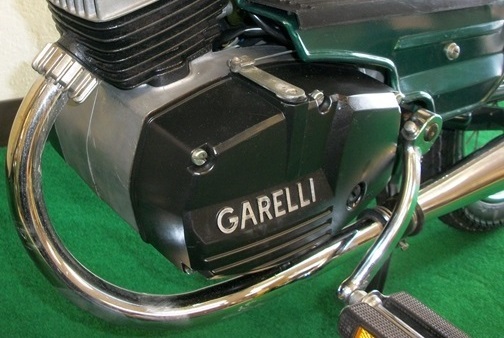 Sachs 505, Morini MO1, MO2 and Garelli VIP engines are some common examples. 1-2″ inch below the tool. Here it is held high up. Straightening: 1. 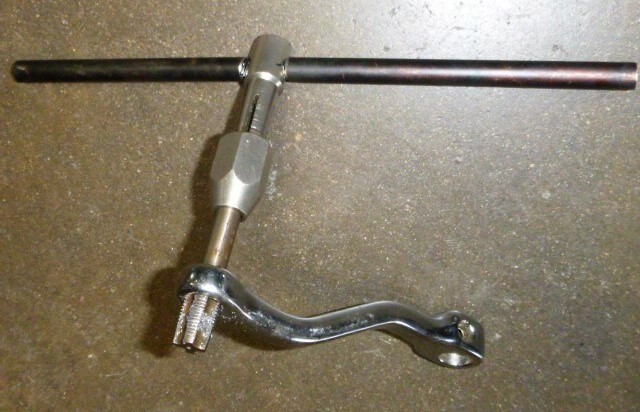 With a special tool like the one shown, and two people, a bent pedal crank can be straightened in one minute without any removal. The second person has to pull on the bike the opposite way, by standing hard on the opposite pedal. 2. 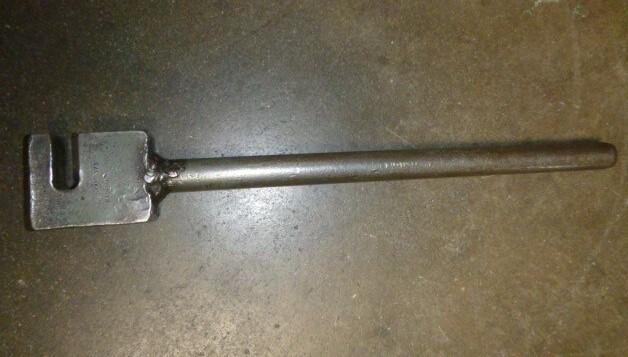 Without that tool, the pedal only is removed and a long pipe that fits closely over the crank is used to apply torque. 3. 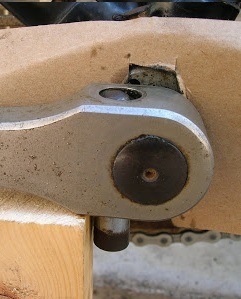 For more stubborn cranks, the crank is removed and placed in a large bench vise. Again the pipe is placed over the crank at the right place, and torque is applied. 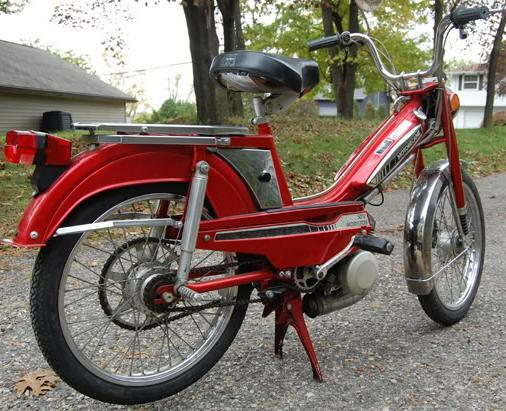 Moped cranks require 100 to maybe 600 foot-pounds of torque to bend. This is done without heating. Re-threading: Often just the first few threads become messed up. 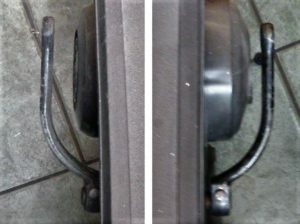 Bicycle shops have pedal taps, size 9/16-20 Right and Left, that can repair partially-stripped threads on moped cranks. Hardware stores do not have those taps, instead they have 9/16-18, more coarse. So pedal taps are a bicycle-industry-only item. Repairing pedal crank threads is done by starting the tap from the good side, which is the back. 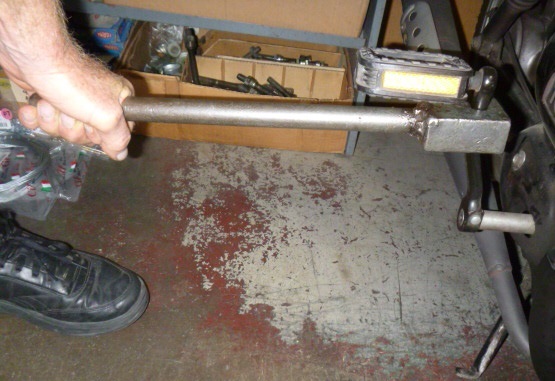 Sometimes crank removal is required, and sometimes it is optional. Cutting fluid, or at least oil, is applied. The tap is moved back and forth as it is screwed in (like 4 steps forward and 3 steps back), until it goes all the way through. Rethreading a M14-1.25 crank to 9/16-20 (from 14.0 to 14.3mm) is more difficult. The plated steel is hard and tough. It takes longer and requires more force. 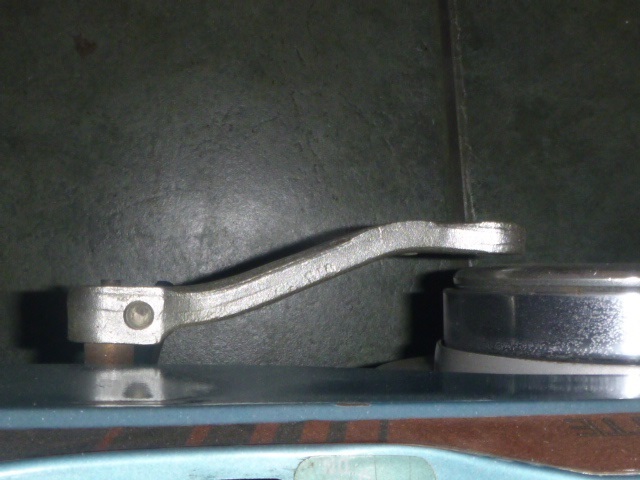 The crank arm and tap get hot by the end of the 10-20 minute process. These round pins have a flat wedge that fits tight against a slot in the shaft. They are pressed or hammered in and out. In the bicycle industry they are known as cotter pins. Here they are called crank pins or wedge pins. Two sizes 9.5 mm $2, and 9.0 mm $2 each. One Up One Down: This rule says that if one crank pin points up, then the other should point down. This makes the left and right crank arms parallel at 12 o’clock and 6 o’clock. When the pins are both up, the arms are at 12 o’clock and 5 o’clock, lopsided and awkward. 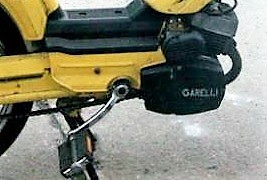 Some mopeds with external pedal shafts, and separate pedal and motor chains, have one of the crank arms permanently attached to the shaft and sprocket. With those, to get a new sprocket-side arm you have to replace the shaft-with-arm. 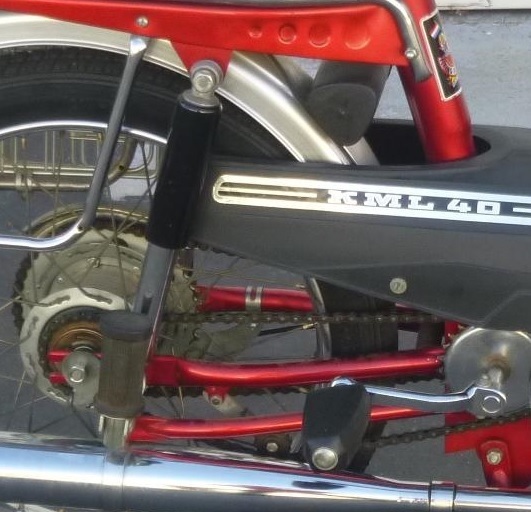 Some mopeds with external pedal shafts, and separate pedal and motor chains, have no crank arms permanently attached to the shaft and sprocket. With those the sprocket-side arm can be replaced. Some mopeds have one drive chain and some have two. Two-chain mopeds, with both a motor chain and a pedal chain, have freewheels, like most bicycles. 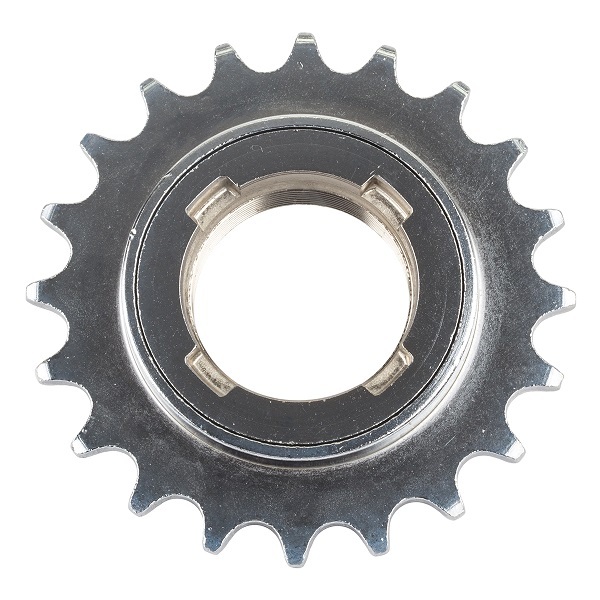 The freewheel is the rear pedal sprocket that spins free and goes “click click click” in the reverse direction, but locks up solid in the forward direction. 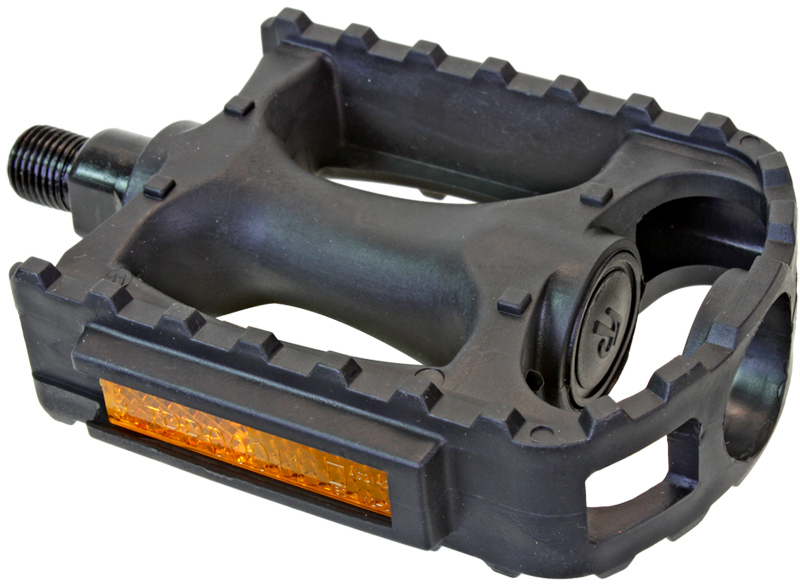 The freewheel allows the pedals to be stationary even when the rear wheel is moving forward. The moped brands with right-side freewheels are Puch, Peugeot, Motobecane, Batavus, Sparta (Foxi), Hercules (Sachs), Piaggio (Vespa), Honda (PA50), Kreidler, KTM (Foxi), Kynast, Flandria. There are two brands with left-side backward freewheels, Jawa and Benelli. 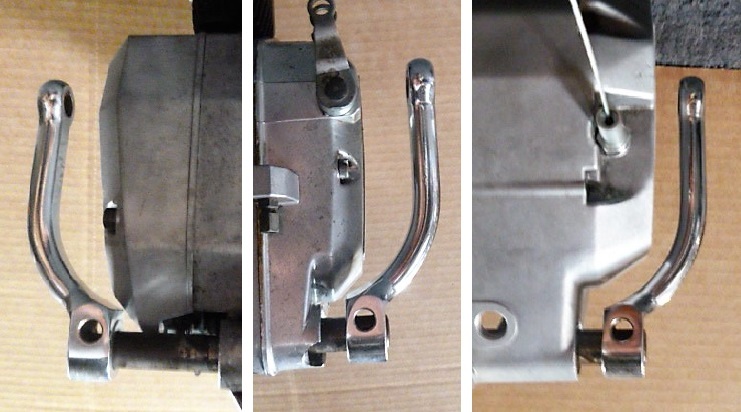 All of the other moped brands do not have external freewheels, but instead have a freewheel mechanism inside the engine unit. The freewheel screws on and tightens with pedaling. Once it is tight, a special tool is required to remove it. The tool fits into slots in the freewheel center. Some low-end modern single-speed bicycle freewheels do not have removal slots. Those cheap kinds can be removed by destroying the freewheel. To remove a freewheel destructively without a removal tool, the freewheel is first disassembled, where all the little balls and clickers fall out, and then the inner hub is unscrewed in a bench vise or with a pipe wrench. 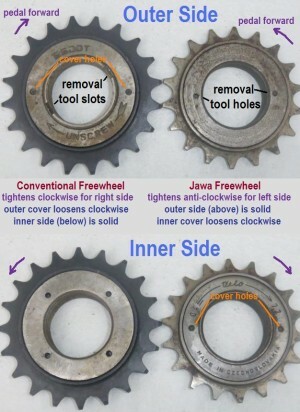 Most freewheels go on the right side of the bike and thus have right-hand thread, but Jawa and Benelli ones go on the left side of the bike and have left-hand thread. 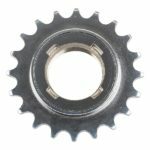 Freewheel threads: Like with pedal threads there is a common size and an uncommon size slightly smaller. The common size is 1.375″ – 24, which equals 34.92 – 1.06 mm. Most modern bicycles worldwide have this ISO (International Standards Organization) standard freewheel thread type. The uncommon size is M34.7 – 1.00, which equals 34.70 – 1.00 mm. 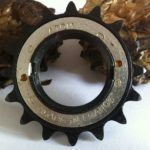 This “French” thread type is on vintage bicycles from France, Belgium, Spain or Switzerland, and on Motobecane mopeds with Motobecane-made hubs. So the French freewheels are slightly smaller than the rest of the world, 34.7 instead of 34.9. That small amount does not matter as long as the bike is pedaled gently. But it does matter when the pedals are pushed very hard. Then the loose fitting threads on the wheel hub can strip out, a disaster. It is difficult to tell which thread type a hub has, by measuring the thread tops with a calipers. The 34.92 thread hubs measure 34.65 to 34.7. The 34.70 hubs measure 34.55 to 34.6. On some hubs the tops of the threads are worn down and measure less. So a standard thread might seem like a French thread type. Because of this, it is better to put away the calipers and use “feel”. 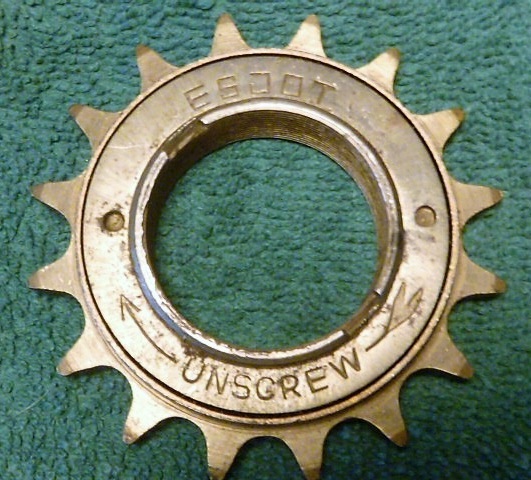 When the freewheel and hub have the same thread type, the freewheel screws on easy, yet has no looseness. Looseness is felt with fingertips pulling and pushing the freewheel center side to side. 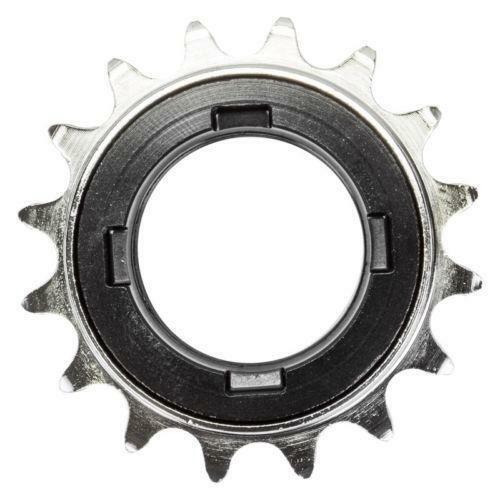 When a 34.92 freewheel is on a 34.7 hub, the center of the freewheel can move 0.22 mm. Here is a video of that. That looseness or “wiggle” is felt. The same is true for any threaded thing. When a bolt fits a nut, it screws on easy and yet does not wiggle. All of the freewheels in Myrons Mopeds inventory were measured by feel. For each bike model listed above, a sample rear wheel with original freewheel was measured directly by feel. The freewheel was removed. It’s threads were checked by screwing onto both a French and a standard hub. The wheel threads were checked by screwing on both a French and a standard freewheel. 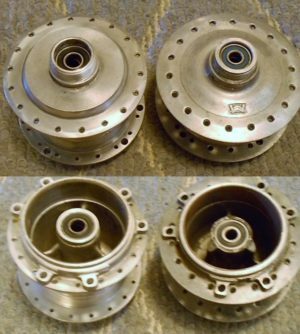 Gauntlet of test wheels: MB 40, Batavus M48, Peugeot 103, Model 7 hub, MB 50, MB 50, MB 50VLA. Not shown, Puch wheels and hubs, Sparta, Peugeot 102 hub, Kreidler, Sachs, KTM, Kynast, others. Result: None of the hubs or freewheels had French thread, except Motobecanes with Motobecane-made hubs. Wow! These are actual Motobecane rear wheels from Myrons inventory. All except one came from Los Angeles area bikes. Result: All Leleu-made hubs have standard freewheel thread 1.375″-24, even those for Motobecane. 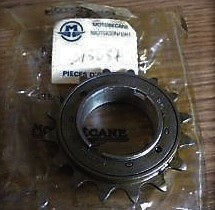 All Motobecane-made hubs have French thread M34.7-1.0. All Motobecane-made “6-star” mag wheels have standard thread, but it is tapered and begins with French thread, so that either type of freewheel can be used. How to tell: The best way to tell if a 1970’s Motobecane moped rear hub is Motobecane-made (and therefore French thread) is visually. There is an prominent M logo on the freewheel side. There is no step on the freewheel side, instead it slopes gradually. The flanges go farther out from the spoke holes. So from 100 feet away, viewed from the side, the Motobecane-made hubs appear larger than Leleu-made hubs. All two-chain rear hubs or wheels, on mopeds from the 1970’s and 80’s, have standard freewheel threads, except Motobecane-made hubs on 1950’s -60’s and some 1970’s Motobecane mopeds. 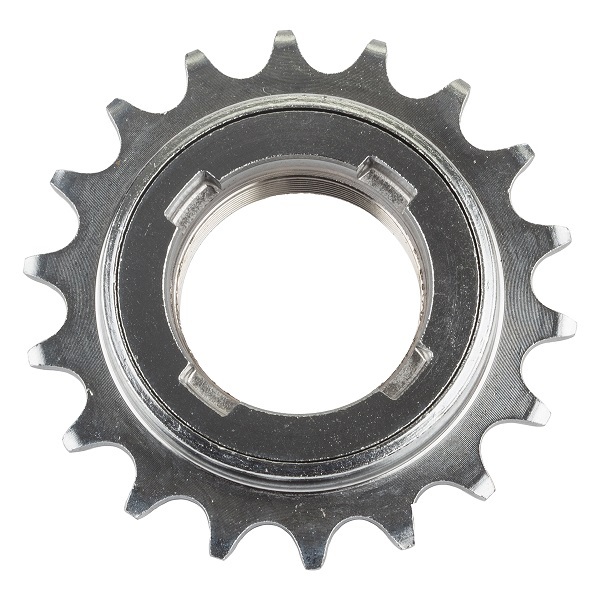 A standard thread freewheel fits a French thread hub and works fine when pedaled normally. 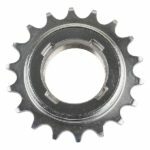 Only when a strong athletic person pedals very hard, the hub threads can strip off, requiring wheel or hub replacement. 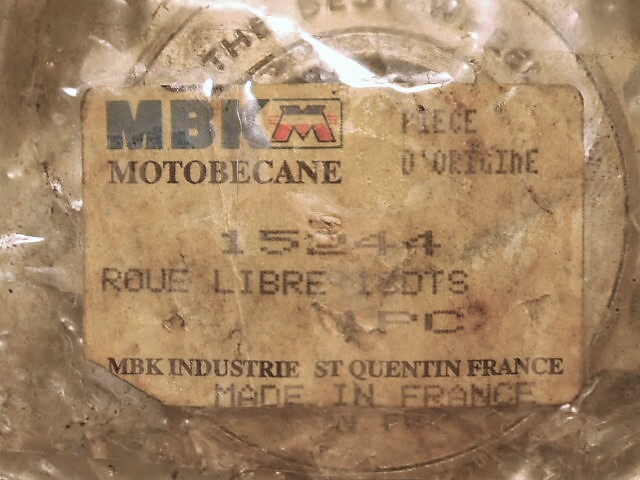 1950’s – 60’s Motobecane: Many models, maybe all, had French freewheel threads M34.7-1.0. In the 1960’s the parts manuals specified the thread. One example, shown at right, is for Motobecane AV88 and Motoconfort AU88. 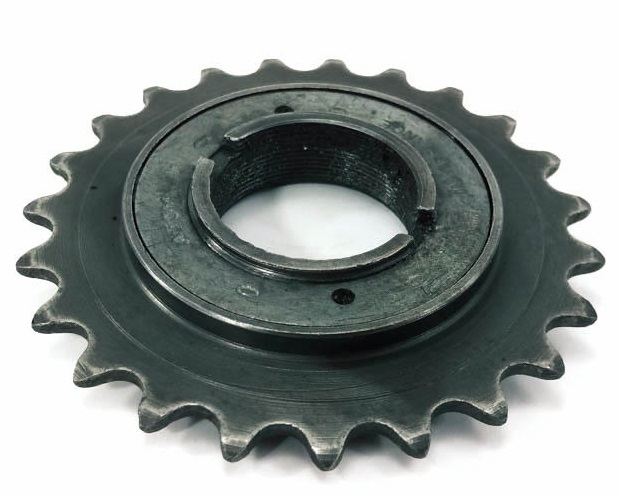 It lists the 18-tooth 15244 freewheel as having M34.7-100 thread. 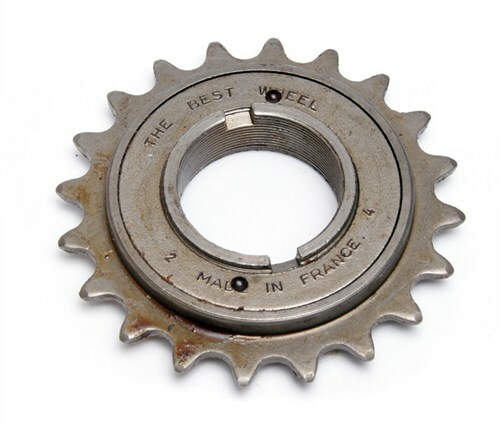 The French freewheel thread cover up: It is very odd that, after 1976-77, Motobecane had two different freewheel threads, but they hid that fact. Instead they made the teeth different, 15244 (French thread) was 18 teeth, and the newer 14298 (standard thread) was 20 teeth. 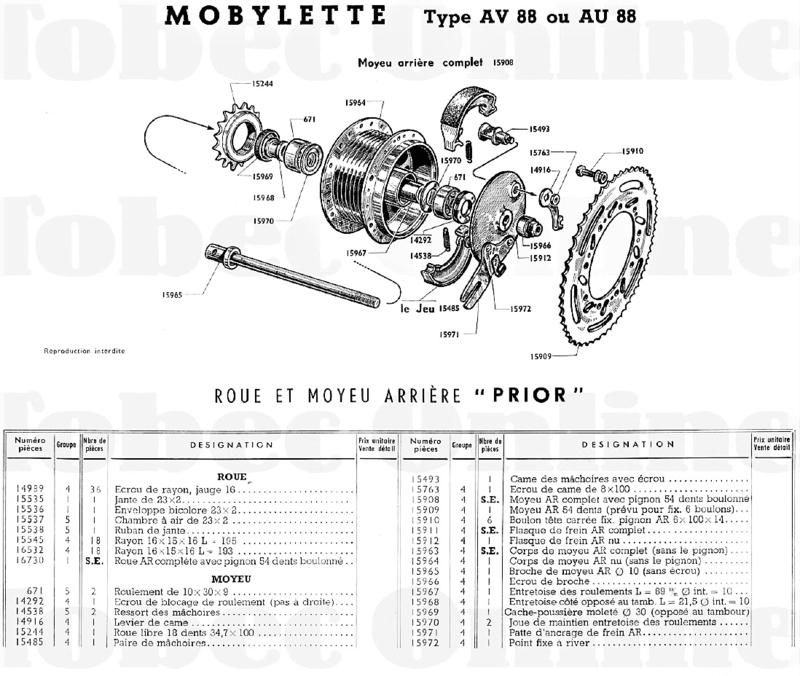 The Motobecane America parts manuals list both freewheels without explanation. There does not seem to be anything about freewheels in the Parts or Service Bulletins. 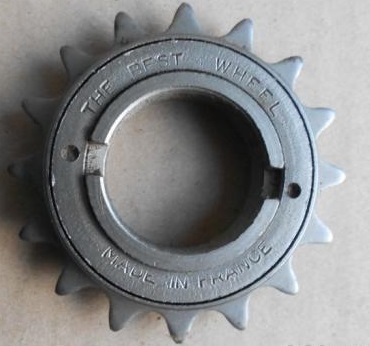 The physical freewheels do not say the thread. The actual parts labels do not say the thread either. As a result, this cover-up has caused confusion and mystery for 39 years (1978-2017). You are currently browsing the archives for the Pedal Parts category.